Just a heads up for everyone that may have someone in their family that wants to learn to surf. 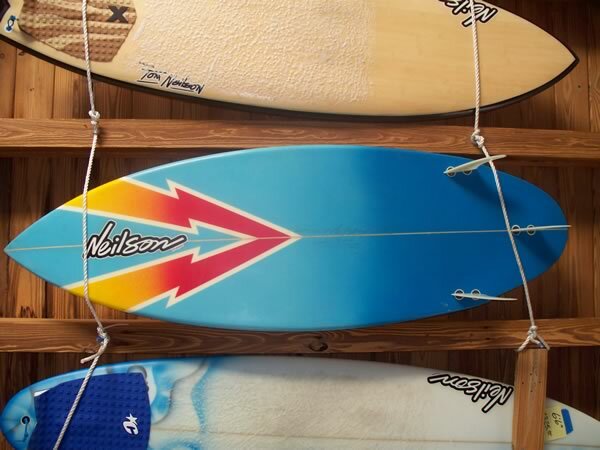 Neilson Surf Shop is having a Summer Surf Camp starting May 30th and lasting through August 12th. Come by and reserve a spot today! Just a shot of the shop counter with all sorts of goodies – hats, fins, sunglasses, sunscreen, stickers, wax, artwork and all other sorts of random radness! I took your advice, and Jordan (Ohana surf shop) took great care of me. I purchased a 5’10 boost, proceeded to surf very small and crumbly North Jetty. From the first wave to the end of my session, I was extremely surprised and happy, the way it caught waves and the speed it generated were great! It passed my picky test: backside, rode smooth. Seriously, I enjoyed your boost a lot more than the Lost Rocket, and their Sub-Scorcher. Your Boost gave me a lot more enjoyment than a CI Whip. When I sell off a couple of my old boards, I’d like to get a high performance thruster (one that will work in Fla., and possibly a single fin (for gutless S.Fla.) Thank you for calling me on the phone, and for putting some fun back into my surfing. Thanks Josh! Stoked that one of our Neilson Dealers was able to take such good care of you and that you’re enjoying your new Neilson Boost! There’s a 6’6 round tail, a cool little 5’8 x super thick and a Bamboo/carbon Floatey Fish. That pretty much covers most waves we get.